Thomas Jefferson, along with Alexander Hamilton and financier Robert Morris, had long advocated the use of the decimal system. Introduced by the Dutch inventor Simon Stevin van Brugghe, it used whole numbers to describe fractions and was translated into English in 1608 as Disme: the art of tenths, or, Decimal arithmetic. Jefferson saw decimal coins as the solution to the conflicting foreign systems already circulating in North America. The gold ten-dollar piece would be roughly equal in value to the British double guinea. The silver dollar and its fractions would correspond to the Spanish eight reales. Copper cents would be equivalent to English halfpennies. The Mint Act passed by Congress on April 2, 1792, provided that “. . . the money of account of the United States shall be expressed in dollars or units, dismes or tenths, cents or hundredths, . . . a disme being the tenth part of a dollar . . .” It was fitting that this country, born of revolution, should use a revolutionary system for coinage. After the poor reception afforded Scot’s creation, Mint Director Henry DeSaussure addressed the immediate need of improving the coinage. Going outside the Mint, he engaged artist Gilbert Stuart to submit a sketch for a new Liberty head. Stuart modeled his Liberty after the buxom Mrs. William Bingham of Newport, Rhode Island. Using Stuart’s sketch, transferred to a relief model by John Eckstein, Scot engraved the dies for the new half dime. 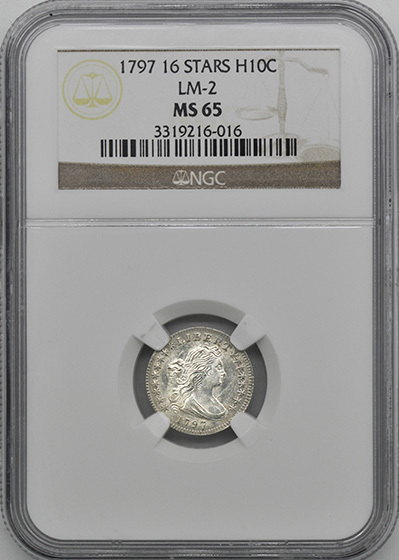 Released in 1796, the coin’s obverse design consists of a Draped Bust profile of Liberty facing right, with flowing hair secured by a ribbon. The word LIBERTY is above her head, and the date is below the bust. Stars flank each side. The coin’s reverse depicts an open wreath surrounding a small eagle that is perched on a cloud. The eagle is smaller than the one on the Flowing Hair design of 1794-95, but it has a fuller breast. The inscription UNITED STATES OF AMERICA surrounds the wreath. The 1796 half dime has eight stars on the left and seven on the right, representing the fifteen states, including the new states of Vermont (#14) and Kentucky (#15). In 1797, a fifteen-star variety was struck, and later a sixteenth star (eight right, eight left) was added after Tennessee was admitted to the Union on June 1, 1796. Director DeSaussure’s successor, Elias Boudinot, realized that they couldn’t go on adding stars ad infinitum, so the last variety of 1797 had only thirteen stars (seven right, six left). Henceforth, thirteen stars would be used to symbolize the original union of states. There were 54,757 half dimes of this design minted. Only a few varieties exist, and all are rare. Even type collectors find this issue a challenge. In 1796, there is a late die state example with a broken “B” in Liberty that appears as “LIKERTY” and an overdate, 1796/5. The 1797 coins were minted from only three obverse dies having either fifteen, sixteen or thirteen stars. No proofs were made, but supposedly there is a single 1797 15 star prooflike presentation piece that can be traced back to Mint Director Boudinot. It was sent to Matthew Boulton in England as an example of the Mint’s capabilities. It was last reported in the collection of Harold Bareford but did not appear when his coins were auctioned in 1981. One reason for the paucity and low quality of coinage during this period was the yearly outbreak of yellow fever in Philadelphia during the summer and fall months. The epidemic was particularly ferocious from 1797 through 1804, and during some of these years the Mint was temporarily closed throughout the yellow fever season. Key employees—engraver Joseph Wright and assayer Joseph Whitehead—succumbed in 1793, and Mint Treasurer Dr. Nicholas Way was felled in 1797. Official procedures were instituted for closing the Mint in these emergencies, including provisions to pay off the workers and instructions for coining or securing the bullion that remained on hand. All dies were to be packaged and sent to the Bank of the United States for safe keeping. 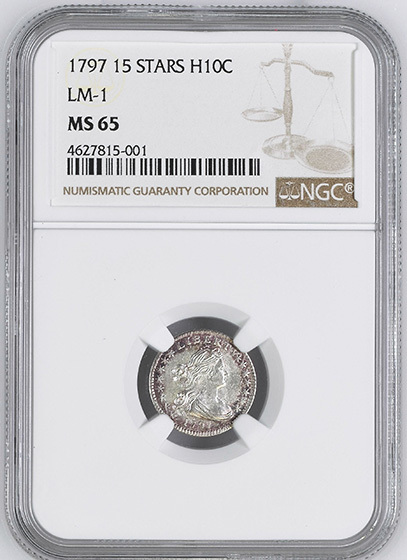 It should be noted that most Draped Bust/Small Eagle half dimes are usually very weakly struck, particularly in the center of the coin. This presents a grading challenge, as the typical specimen may grade only Fine. Wear first shows on the hair above Liberty’s forehead, at the hair over her ear and shoulder and on the area where the bust meets the drapery line. On the reverse, check the center of the eagle’s breast and the ribbon. Thomas Jefferson, author of the Declaration of Independence, was also the author of the philosophical direction of the United States. He grew up on the edge of civilization in the “hard scrabble” life of American Colonial days, a self-taught, natural student who learned the basics of living from the books he loved. His heroes were not politicians or soldiers, but philosopher-scientists such as Isaac Newton, Thomas Bacon and Adam Smith. Jefferson was living in Paris in the 1780s, absorbing the new spirit of Enlightenment. He embraced a philosophy that taught the unbiased pursuit of knowledge and skepticism of “truths” long taken for granted. The aim was to no longer just reflect on the state of the world or contemplate another, but to change it. As Secretary of State under George Washington, Jefferson’s public policies reflected his belief in rational change. When it was time for the fledgling United States to create a system of coinage, he knew a decimal system was a scientific and practical necessity, as he followed the work of Simon Stevin van Brugghe who, in the late 16th century, invented the decimal system as an alternative to fractions. Stevin’s pamphlet, De Thiende (1585), later translated by Robert Norton as Disme: the art of tenths, or, Decimal arithmetic, was familiar to many of Jefferson’s colleagues, including Benjamin Franklin, Alexander Hamilton and the new Mint Director, David Rittenhouse. 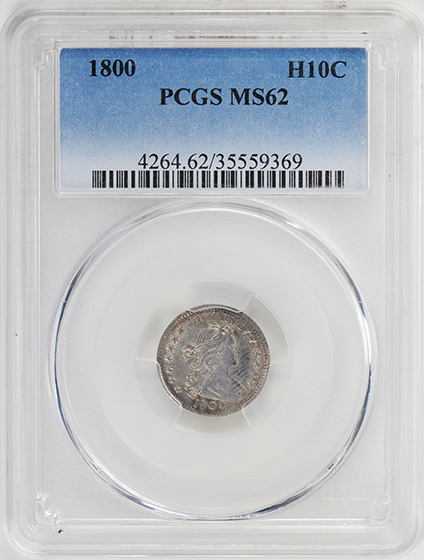 It was fitting that the first silver coins struck at the Federal Mint in 1792 were half dismes, or twentieth-of-a-dollar coins (the spelling “dime” didn’t come into general use until 1837). 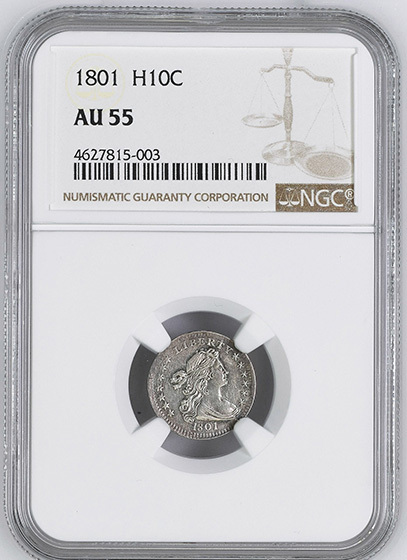 This one act not only established the decimal coinage system in the United States but had enormous political significance, as the coinage of silver was universally recognized as an expression of national sovereignty. Only 1,500 half dismes were made, and Jefferson gave many away as gifts. President George Washington, in his annual address in November of 1792, referred to the half dismes as “a small beginning” in coinage. In November of 1793 the Mint hired banknote plate engraver Robert Scot as the new chief engraver. This decision was regretted in future years, as Scot proved to be egocentric, jealous and, as a tenured Mint employee, cantankerous. He had no experience designing device punches for coins and learned as he went. His first attempt—the 1794 Flowing Hair design—suffered from broken punches and was greeted with harsh public criticism. Commentary of the time described Liberty as wearing a “fright” wig, and the bird on the reverse as resembling a turkey more than an eagle. In 1796, new Mint Director Henry William DeSaussure decided that the coinage designs needed improvement and persuaded the illustrious painter Gilbert Stuart to prepare a new portrait of Liberty. As Scot was too unskilled to translate the buxom portrait to relief, the Mint hired John Eckstein to create the models. Unfortunately, the completed dies degraded Stuart’s portrait, and the finished coins exhibited weakness in the center of the design. This was most apparent on the half dimes. Due to various problems at the mint, including yellow fever epidemics, the design was minted for only two years. No more half dimes were struck until 1800. Scot’s design for the Draped Bust/Heraldic Eagle half dime of 1800 was first used on the gold quarter eagle in 1796, the half eagle in 1797 and the dollars and dimes in 1798. It features a strengthened and more aesthetic rendering of Stuart’s Draped Bust portrait of Liberty, her hair tied with a ribbon. The inscription LIBERTY appears above her head, and surrounding the bust are seven stars to the right and six to the left. The reverse depicts a large eagle with outstretched wings—the Union Shield on his breast—clutching thirteen arrows and an olive branch. His beak holds a ribbon inscribed with the Latin motto E PLURIBUS UNUM (One out of many). Thirteen stars are above the eagle, with an arc of clouds above the stars. UNITED STATES OF AMERICA surrounds the periphery. A total of 124,270 Draped Bust/Heraldic Eagle half dimes were minted from 1800 through 1805, with no coins dated 1804 and no proofs reported. 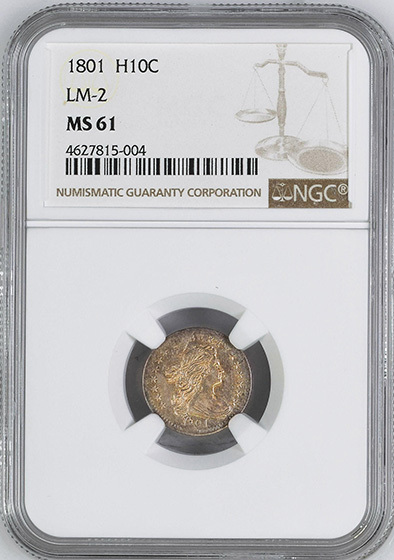 Collectors normally include this coin in a 19th century type set, along with the Capped Bust half dime of 1829-37 and the several varieties of Seated Liberty half dimes (1837-73). High grade pieces are elusive or nonexistent. When uncirculated pieces do appear in the market, they’re most likely dated 1800. The rarest date of the series is 1802, with a mintage of only 3,060. 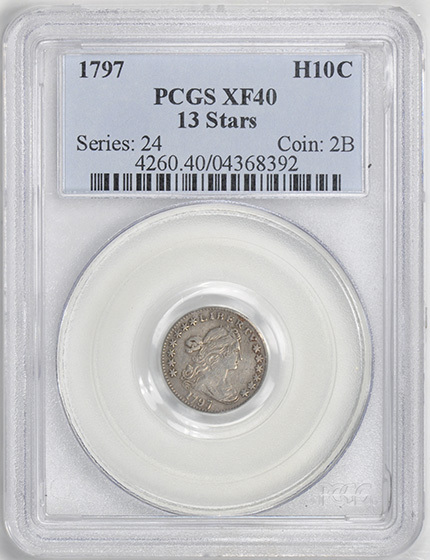 Noted researcher, the late Walter Breen, estimated that only 35 to 45 examples of the 1802 issue survive in all grades, and none in mint state. As counterfeits exist of this famous rarity, authentication is highly recommended. An interesting variety of this short-lived series is the 1800 LIBEKTY issue, made when a defective “R” letter punch was used. When grading this design take into account that, due to poor striking quality, these coins usually exhibit weakness on one or more high points. It is important to discern the difference between poor strike and actual wear. Weak areas often include Liberty’s hair and drapery, the obverse stars and the stars and clouds above the eagle. The first places to show wear are the hair above the forehead and by the ear, on the drapery just over the date and the drapery lines at the bust. On the reverse, look for wear on the eagle’s wing tips and tail feathers. 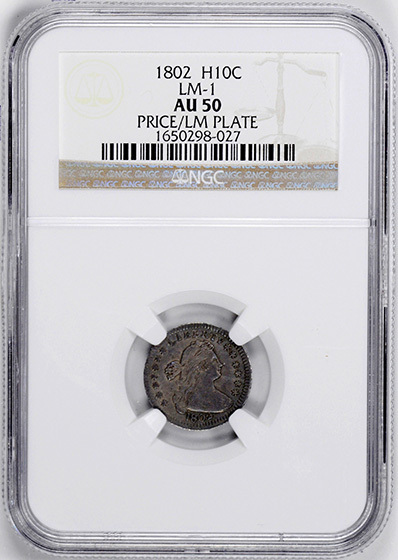 Though the half dime denomination was important in commerce as a convenient way to make change, the Mint’s ability to make enough of these coins was limited. Production of the Draped Bust/Heraldic Eagle half dimes ceased in 1805. The markets, and especially the banks, preferred the large quantities of legal tender Mexican silver half reales (valued at about six cents) then in widespread use. The half dime was not minted again until 1829, when the denomination returned with the William Kneass/John Reich Capped Bust design.